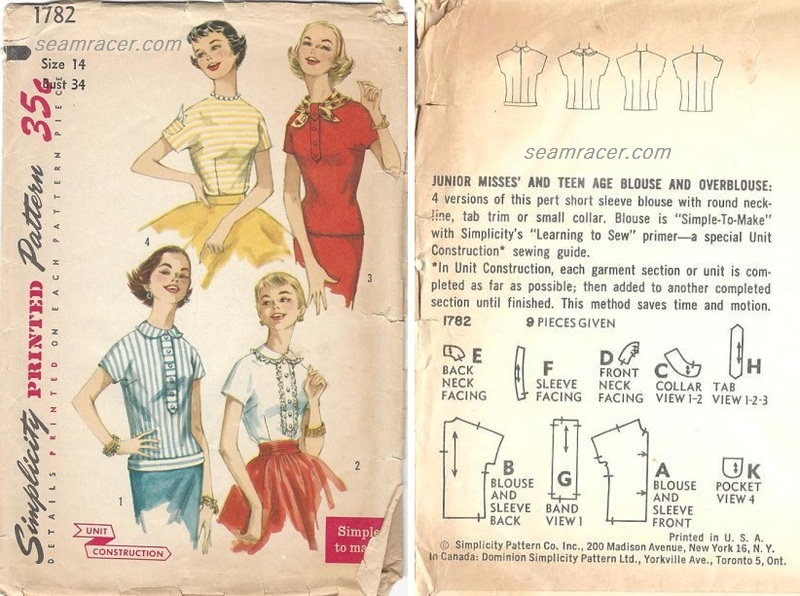 A sewing project that calls for only one yard is good, but two vintage patterns – from one common year in the past – that are unique designs is even better! 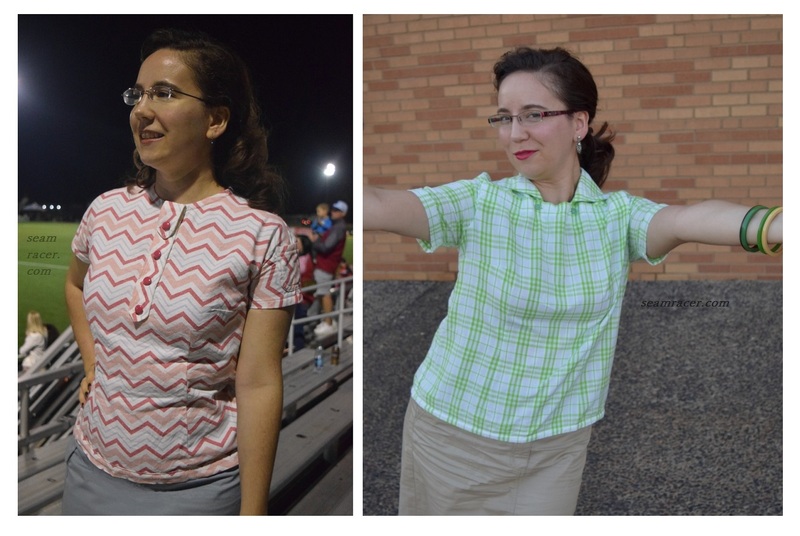 These are casual blouses which I reach for when I need something nice, yet comfy, and sporty. Their timeless designs possess a sneaky vintage air that is very much ‘me’. I like to be different yet also blend in. I appreciate vintage yet want to be fashion forward. I like fine details yet don’t want them to flag people down, and with all that these two tops help me ride that balance in my me-made style. The one blouse was specifically chosen firstly to match with my husband. 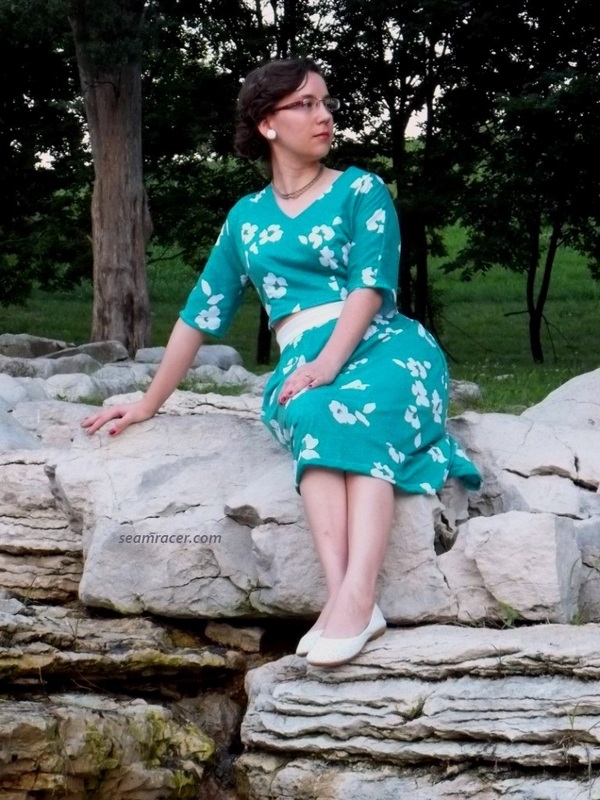 The other blouse was made because I realized I had so many fancy clothes from the 50’s and not enough casual options! 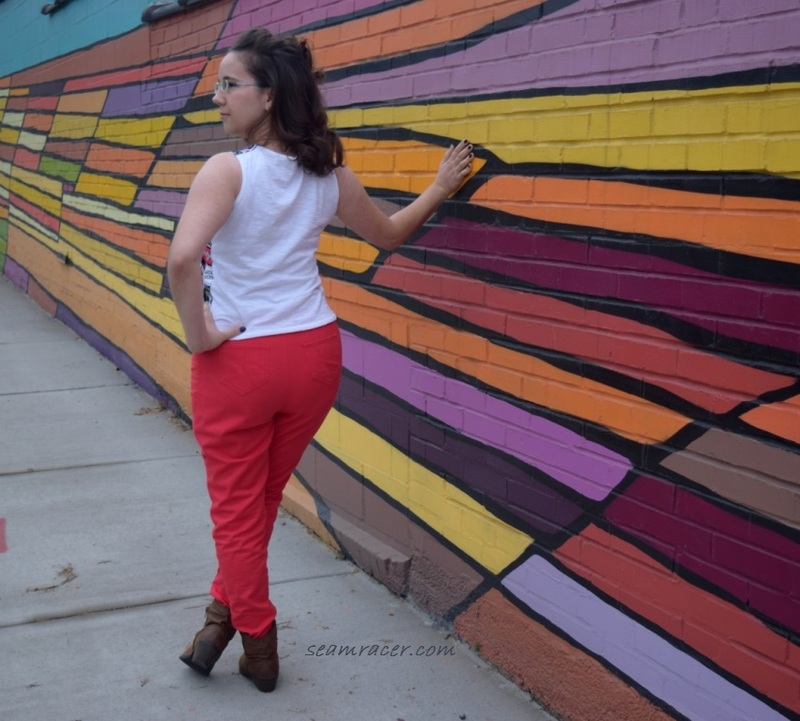 Both are go-to easy separates that work with a variety of bottoms, both skirts and pants in all sorts of colors, so they are super versatile. 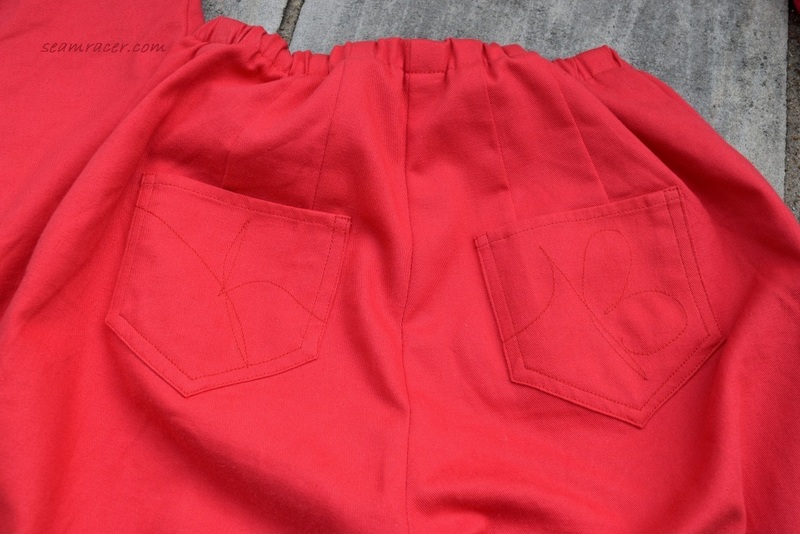 From a sewing standpoint, they were just challenging enough to be good for me yet still easy enough in certain ways to not feel like a project that requires commitment. They have been seeing some good wear recently, with the plaid even going with me to Florida earlier this year, thus it is long overdue to post about them! Not content with just making my own clothes, I – more often than not – enjoy making jewelry to match. 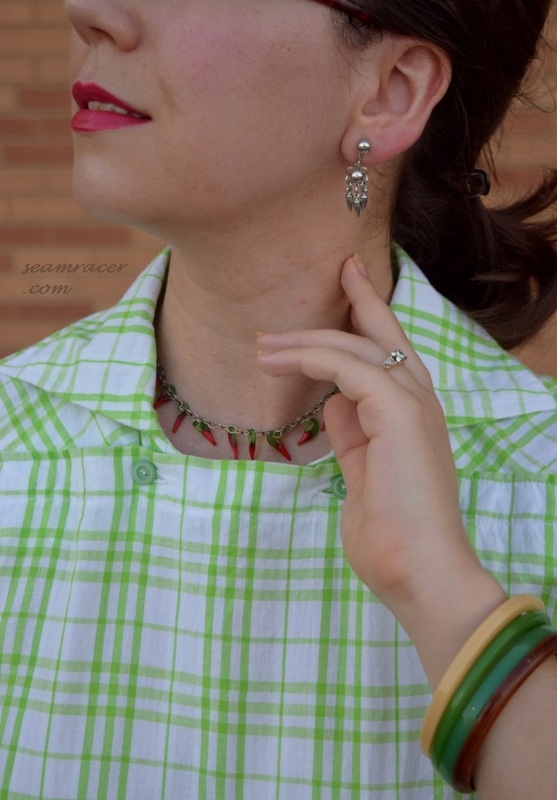 Look for my vintage 40s and 50’s style chili pepper necklace! It was made from little glass handmade charms ordered from Etsy. Then they were attached at intervals to a slightly oversized brass chain to have a very authentic reproduction of a very popular style of jewelry from back then. 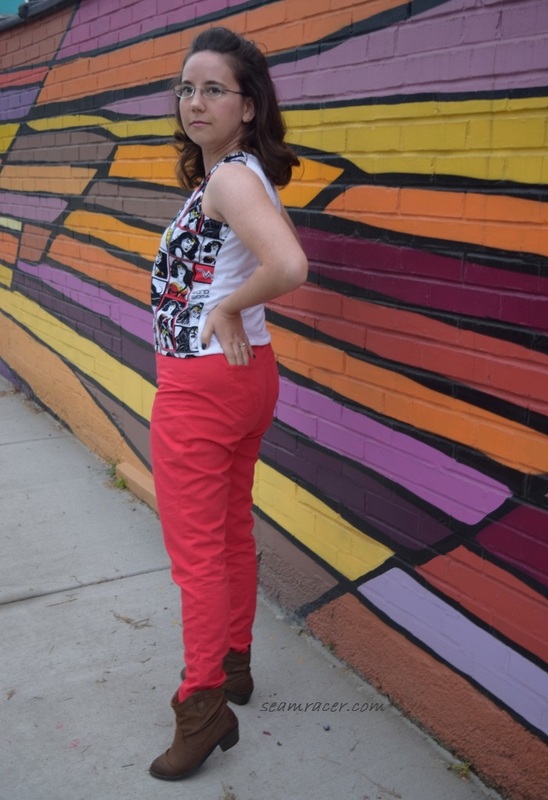 It was so easy to do, and is such a cheerful, bright novelty to spice up an outfit! The rest of my accessories are true vintage pieces. 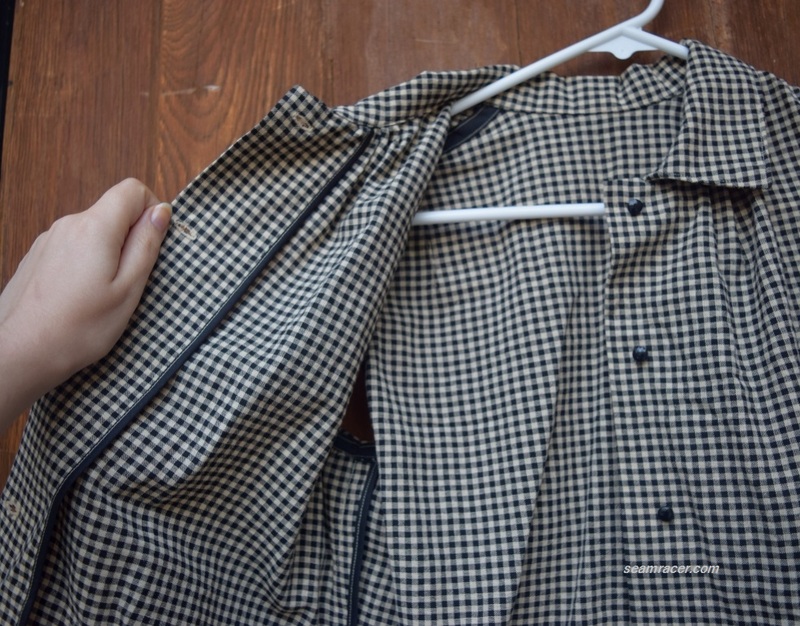 NOTIONS: Amazingly, I had everything I needed on hand already…yes even the long separating zipper for the striped blouse’s back closing! 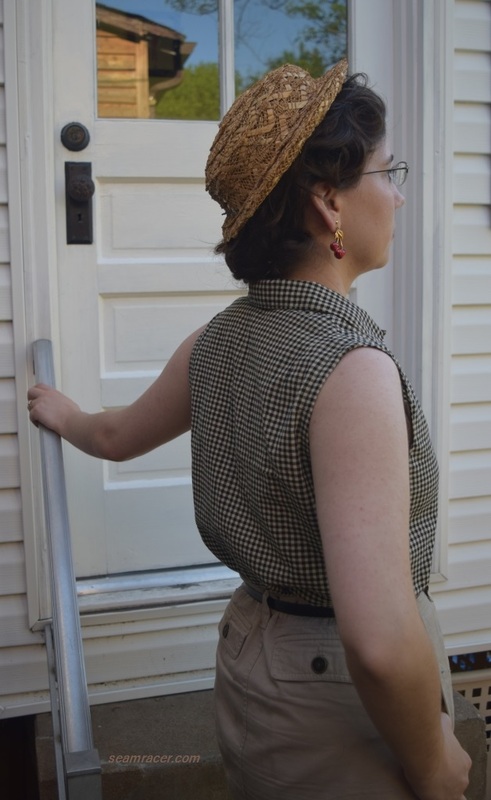 The buttons on the green plaid blouse are true vintage from the inherited stash of my husband’s Grandmother, while the buttons on the zig-zag striped blouse are new, and one of those cheap multi-pack of half a dozen buttons for only $1.99! TIME TO COMPLETE: The green plaid odd-collar blouse took me about 8 hours and was finished on July 22, 2017. 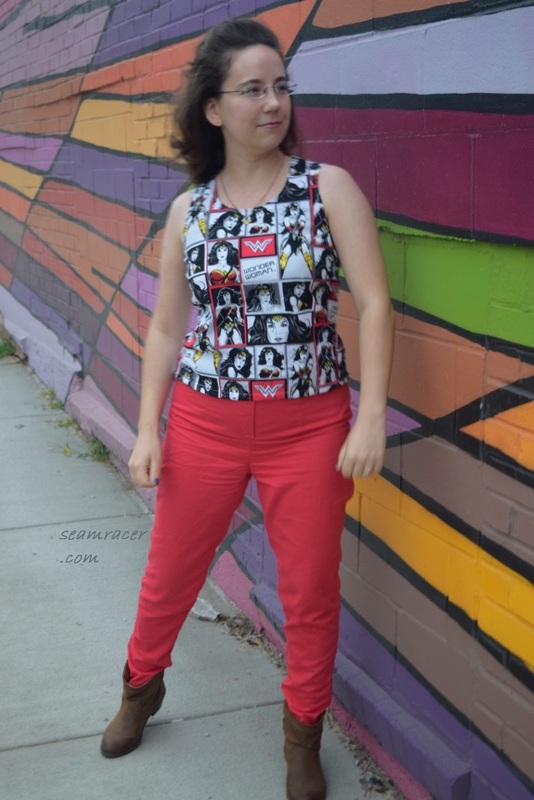 The zig-zag Waverly blouse took about the same amount of time and was done on May 1, 2017. 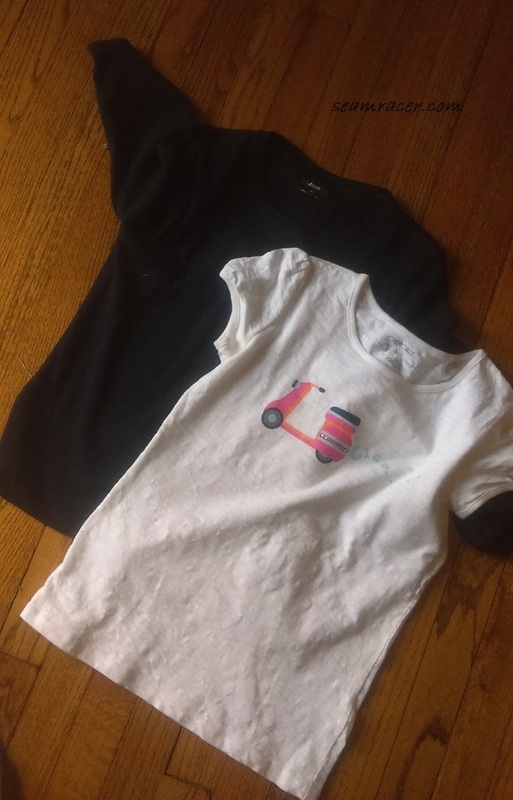 TOTAL COST: Both tops cost less than $3 EACH as they only needed one yard and both fabrics were on clearance as a remnant. I had practice for the green plaid blouse after doing hubby’s shirt with the same collar. Again, as I said in the post about his version, I believe this is called an “Italian Front” closing, but I cannot concretely verify that. So, until then, I will say I could be mistaken. 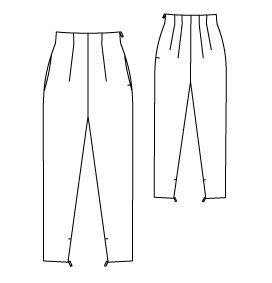 The back of my pattern’s envelope calls this a “two-button horizontal closing”. 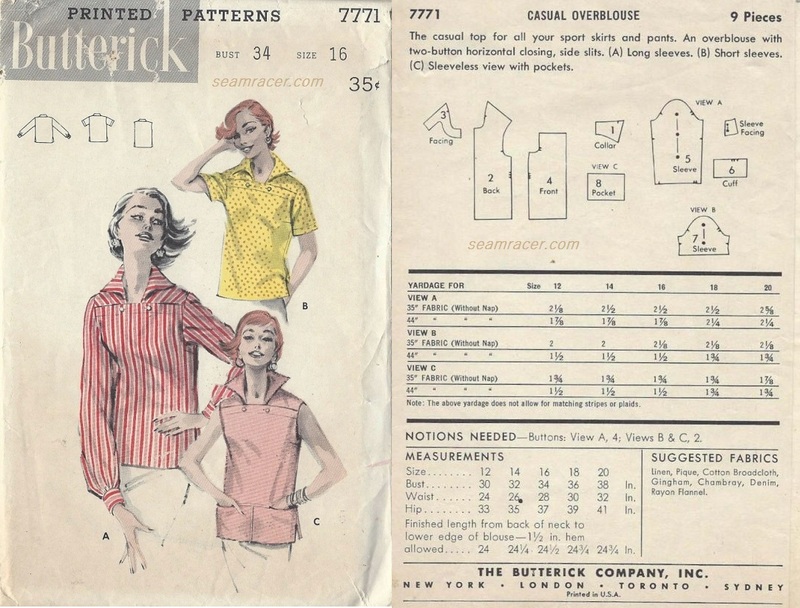 What I find most interesting is that the men’s pattern for a shirt with the same collar came out before the women’s’ version. 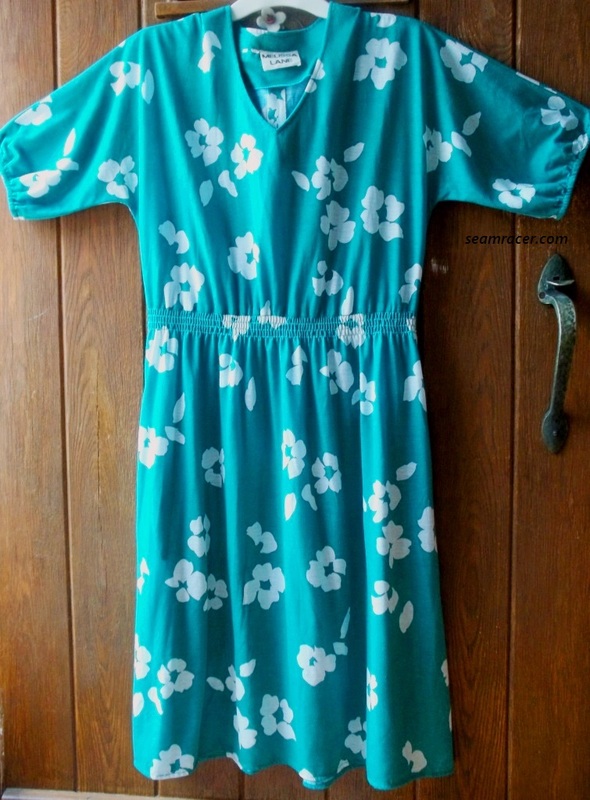 I wonder if it was due to popular demand or just plain fairness on Butterick’s part? Anyway, I do see many more copies of the men’s version pop up on the Internet for sale, but the women’s is much rarer with one showing up here or there. 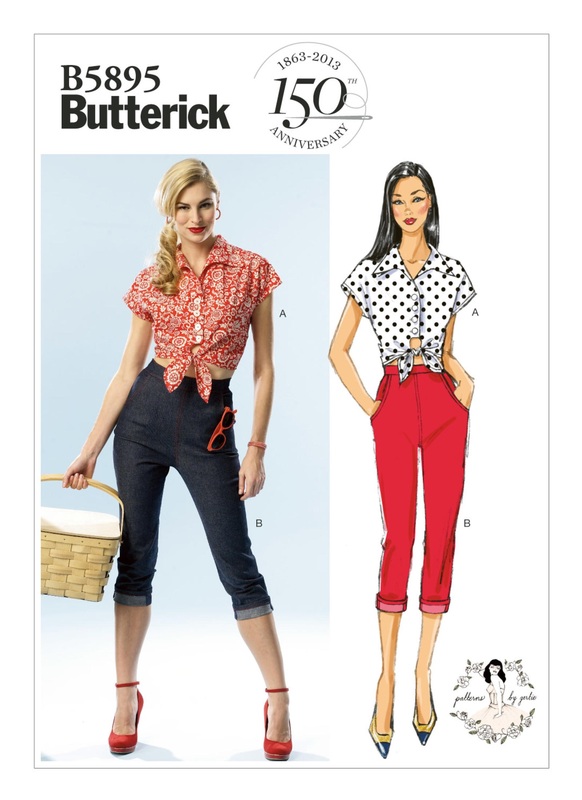 I wonder if the women’s version was an unsuccessful release, but maybe Butterick merely did not print as many copies. 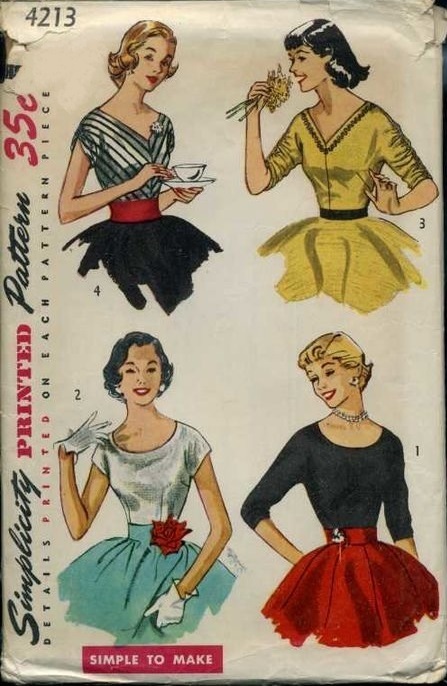 The ladies version was a dime cheaper than the men’s version (45¢), where you get multiple views….surprising because most of their patterns in the years before and after 1956 were about 50¢. 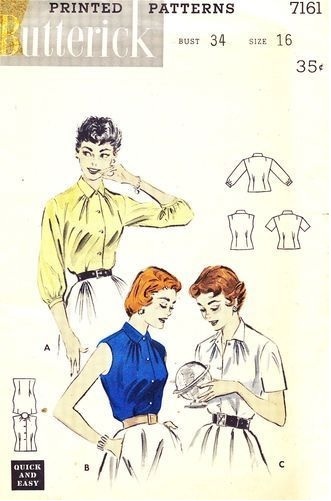 Butterick #7771 only has one view – this style neckline blouse is the only thing this pattern offers (besides the obvious long or short sleeves), something quite unusual in an era where most patterns had two or three different options to make from them. 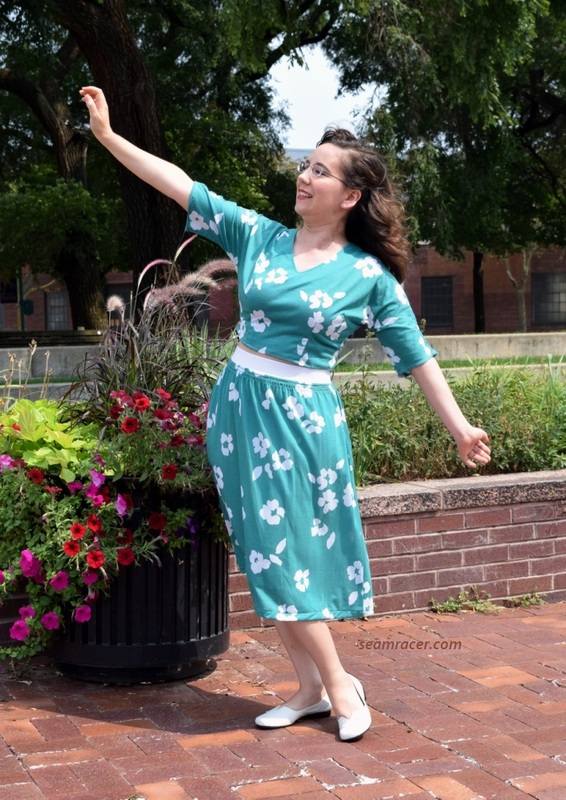 Either way, “if you wanna help sell it, reduce the price”, must have been Butterick’s idea. I love this pattern, between my husband and me we see a lot of interesting options to tweak this wonderful neckline in the future. I do wish they would have made it the same collar construction as was designed for the men’s version. This ladies’ version is more complicated and fussy with the collar being a separate piece from the facing – the men’s was all-in-one! I call for equality! At least I knew what to expect, because it was much harder than my first time and would’ve lost me completely if I had made this before the one I made for hubby. Part of the impetus behind this was of course, as I mentioned, the gushy matchy-matchy factor with my sweetie, but also because I had to give away an old favorite top that didn’t fit anymore which had the exact same color plaid Madras. Granted, the neckline on my old top was not anywhere this cool, but it’s okay to have things better than keep it the same, make it all my own. 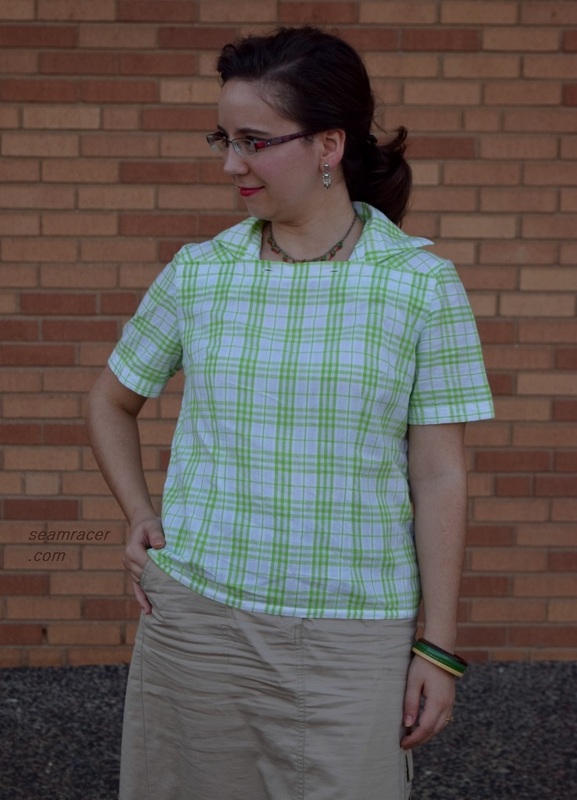 Unlike my old green plaid top, mine is meticulously matched up! 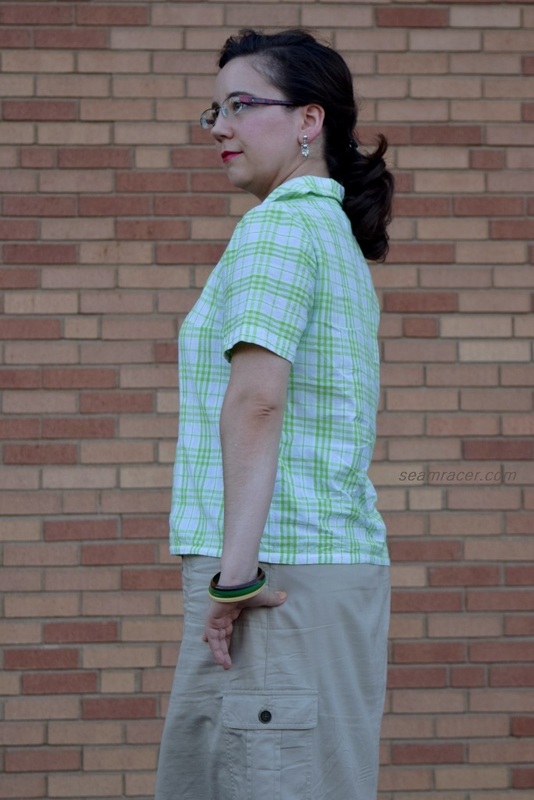 I am not used to the boxy, shorter, untucked blouse shape of this, but it is comfy and easy to move in, but only works with body hugging skirts and pants. 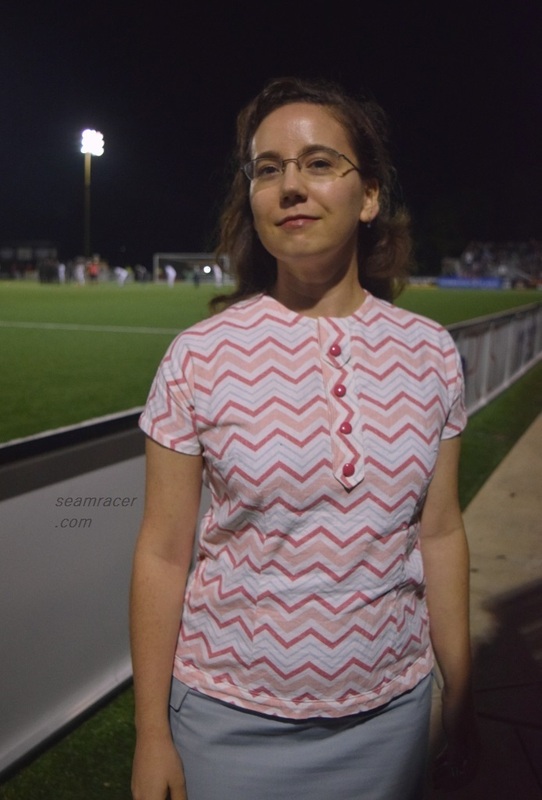 Now, the other blouse is very curve-hugging in a way that forgives the horizontal striping! 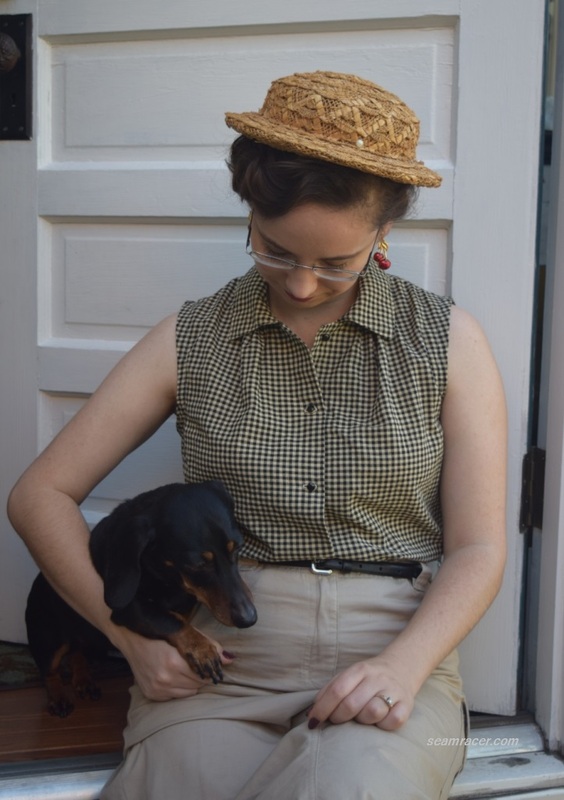 I really think I had some strong luck on my side for this blouse because, as the cotton is a woven, there was to be no forgiveness and a perfect body skimming fit was necessary here. There was no way I was doing a muslin on such a basic project. A pattern tissue fitting on myself seemed promising, but those are not always accurate as paper doesn’t fit like fabric. Take note that this is a Junior’s pattern for teens. 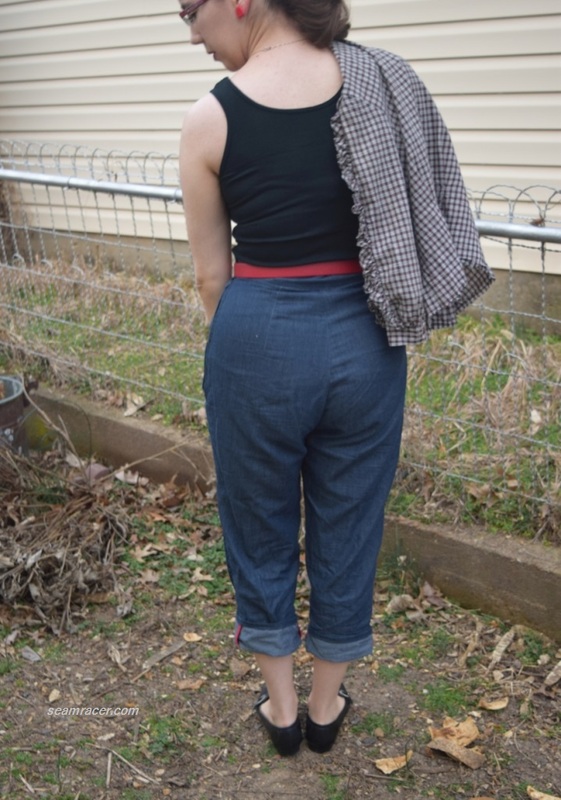 I did not re-size the overall top like I probably should have, as I both didn’t have room on my one yard of 45” width fabric and I wanted a close fit. Beyond a bit of tweaking and resizing as to the dart placement, and lowering the underarm portion of the side seam slightly, this top turned out great as-is, as you can see! The fit is snug, but the pattern is first-rate for being an “Easy-to-Make” design because it is still easy to move in. 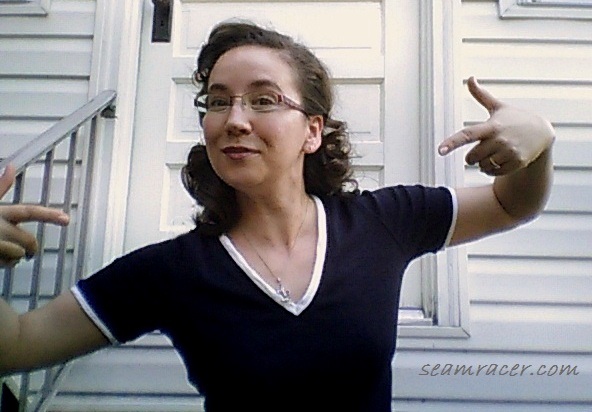 I love the fact I can have the classic 50’s hourglass shape in such a basic tee! 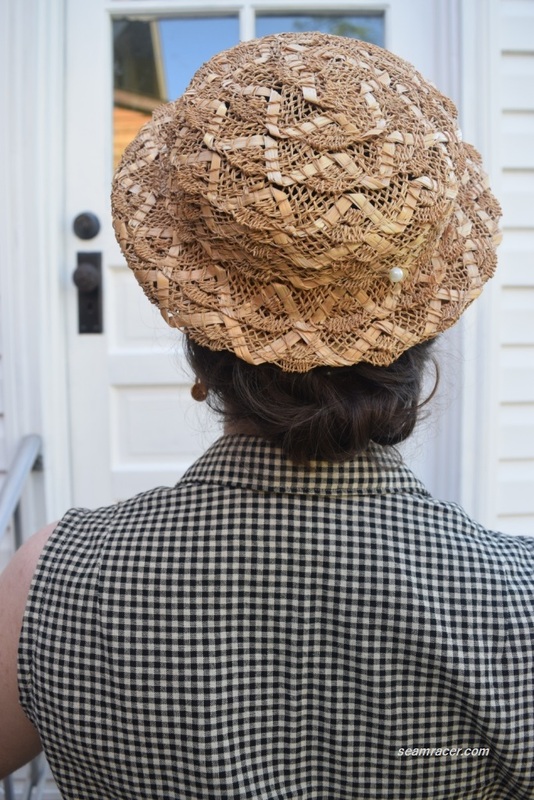 This was ridiculously simple – one front piece, two back pieces, and some fun little details. No sleeves to even set in! As you can see in the pattern front for Simplicity #1782 there are lots of options, so I mix-and-matched to make a combo of three views. That’s what those options are there for, after all. 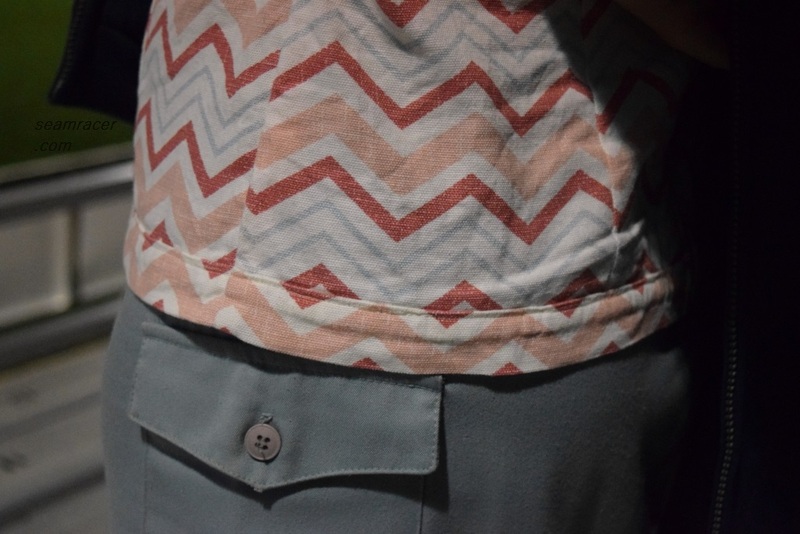 I definitely kept the cute little “mock-placket” feature up the front chest. 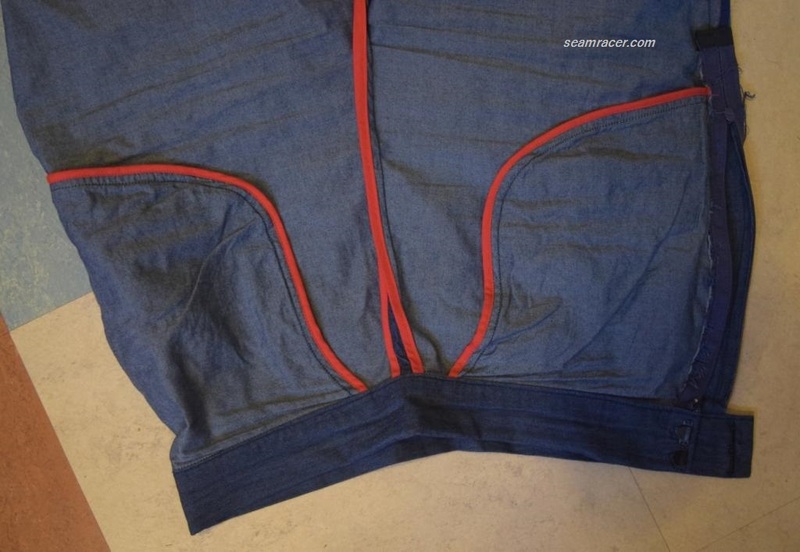 It is really just a glorified strip of fabric that is sewn down in a very interesting way. 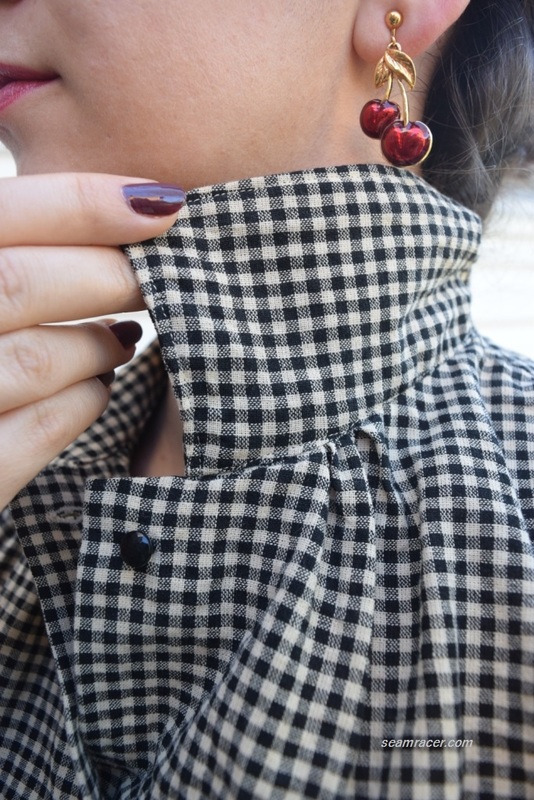 There is an open loop in the top of the tab at the neckline, and when my neck is a bit chilly in the evenings, that tab is great for holding one of my vintage silk scarves, just as the pattern front drawing shows. 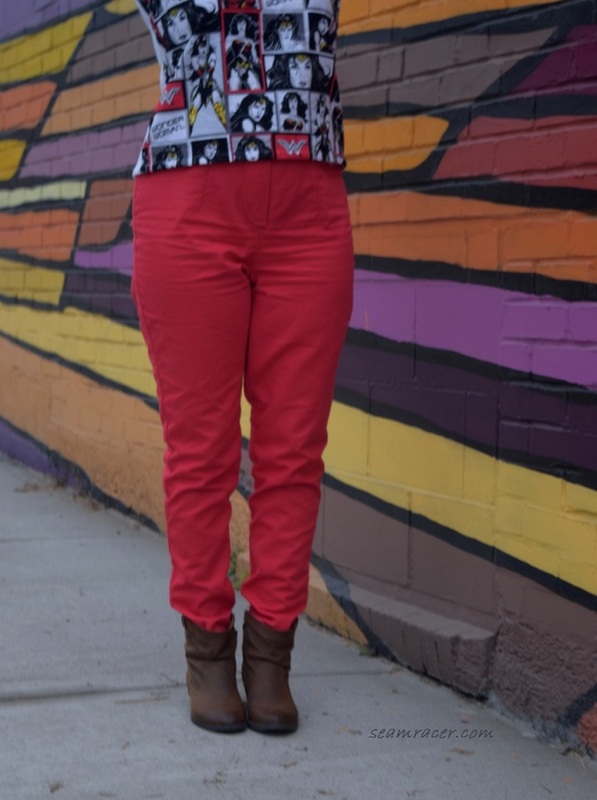 As bold as the buttons are that I chose, I love the crazy fun they add to my top. The one little arm pocket felt a bit ridiculous to make and add on, but hey – I love pockets and they are useful no matter where they are placed or what their size. 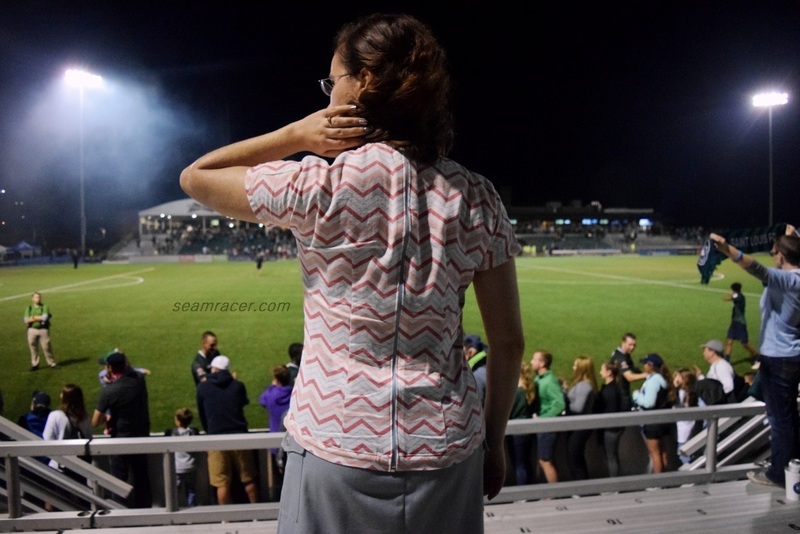 Granted, I like to wear this top with an old favorite RTW skirt that has giant cargo pockets (in the pictures) – but I digress. I will not be pocket prejudiced. It is just enough to fit a few fingers in so it normally holds some spare change or a nose tissue. My little pocket seems to hilariously bother my husband who likes to check it every so often when I wear this top. I added the hem band as an afterthought because I needed a few inches extra to use this matching blue separating zipper that I had on hand. 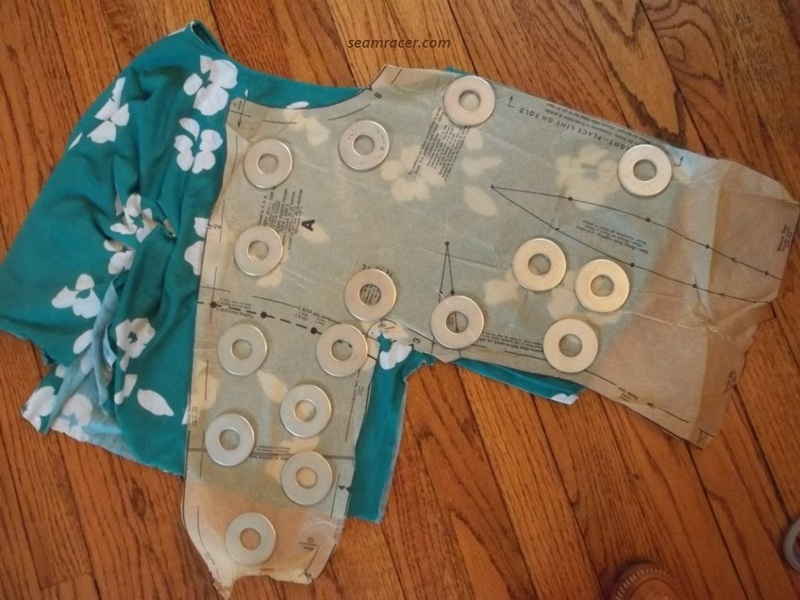 I was determined to use such a special notion on my blouse because there was no way I was doing two separate closures as the pattern called for – a side zip up to the armpit and a small 5 inch neck zip behind. 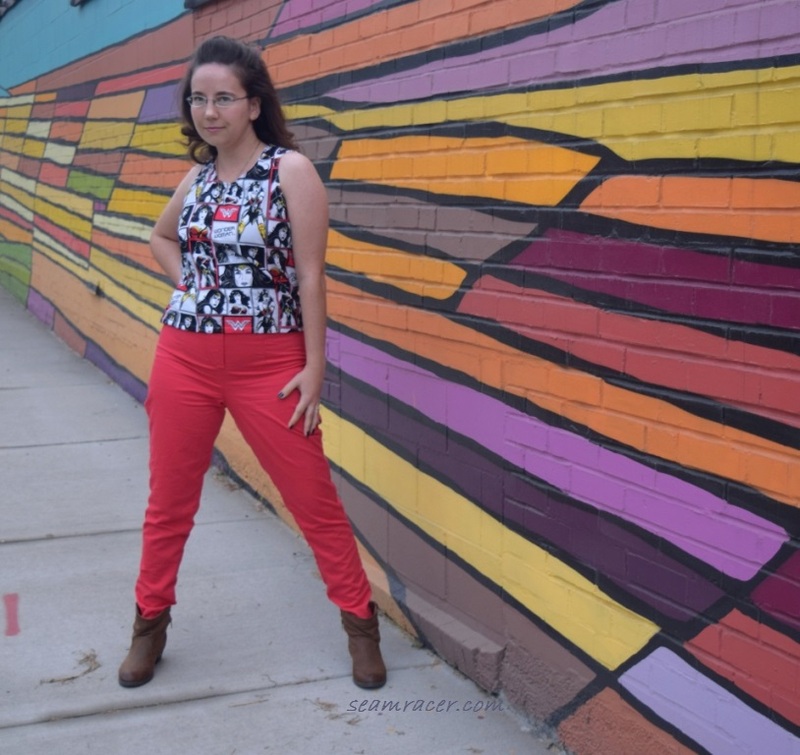 A basic, sporty, and easy-to-sew garment like this needed some modern simplicity in order to be enjoyed both wearing and making! This way all the curious details are not solely in front, either! Our pictures were taken in the middle of doing our living…between errands for the one and at a semi-pro soccer game (football, depending on where you live) for the other. It’s awesome to wear what I make to everyday events that are the bulk of the memories that stay with you. Admittedly, I am always a sucker for making a special outfit for a special occasion, but I find myself appreciating the ones that are there for the commonplace events and prove their worth like an old friend. 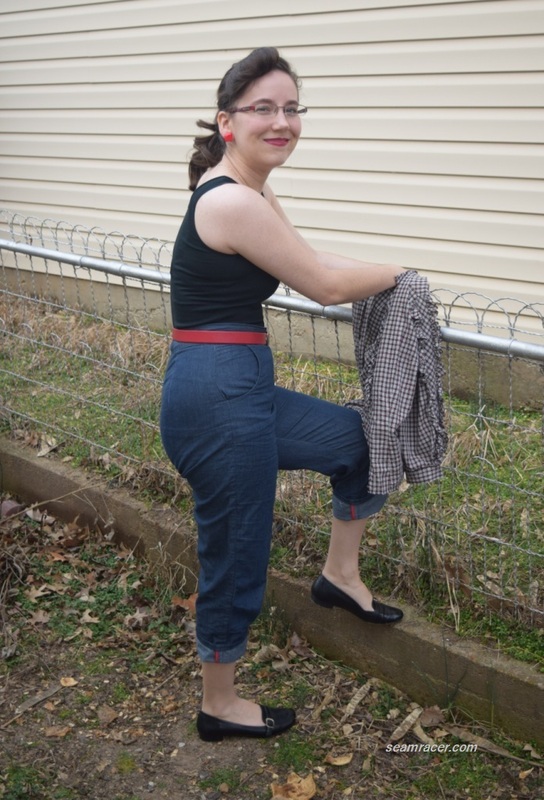 I like making friends with the ordinary and unpretentious side of the mid-1950s!